While the top three contestants in the platinum segment, Lakshina Rodrigo (St.Peter’s) , Charith Asalanka (Richmond) and Raveen Sayer (Trinity) stayed unmoved at the top, Charith Maduwantha of D.S.Senanayake College climbed three steps up to occupy the 5th place being 8th last week in the 11th week count at the Sunday Observer/Mobitel Most Popular Schoolboy cricketer Of The Year contest. In the Gold segment for division two schools Randev Pathirana of Royal College, Colombo maintained his steady lead over Ramindi Nikechala of Devapathiraja College, Ratgama and Ransith Upamal of Dhammaloka, Kelaniya in third place. 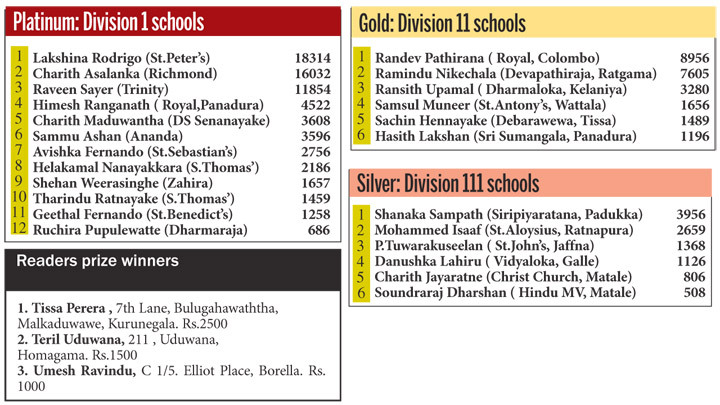 There were also no changes in the Silver contest for division 111 schools with Shanaka Sampath of Siri Piyaratana, Padukka still in the lead with 3956 votes.